It’s Saturday morning, and it was a late night watching the opening cermonies! But WOW – truly amazed by everything that went on. I myself was even scared at the 100-foot Voldemort. I imagine there were many children (annnnd maybe 30 year olds) having nightmares last night! There’s this great place near my work called Russo’s – it’s like a farm stand on steroids. Fresh fruit and produce, with an amazing bakery, flowers, and a killer prepared foods section. They really encourage buying local, which is awesome because it gives local vendors from the boston area a chance to showcase their stuff. And I would like to shake the hands of the bakers at Our Daily Bread (which sadly, apon googling, I found out has closed :() who created the Chocolate Babka that was the base of this morning’s french toast. 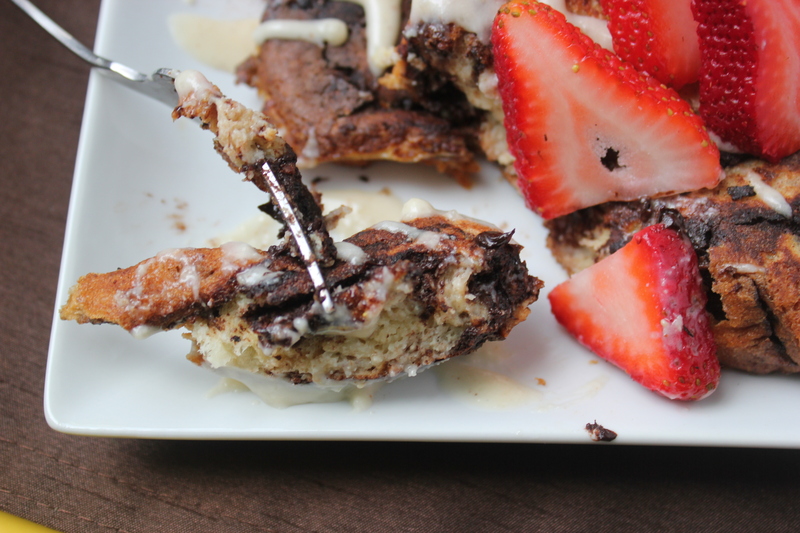 It was like a thick, texas toast, with thick swirls of chocolate throughout. OMG. It’s been sitting in the freezer, just waiting to be utilized for a mind-blowing french toast breakfast, and today was the day. And what a day it was! 1) Turn an electric skillet or non-stick skillet to high heat. 2) Slice the bread into 1/2″ – 1″ thick pieces. Set aside. 3) In a small mixing bowl, whisk together the eggs milk and cinnamon. 4) Dip each piece of sliced bread in the egg/milk/cinnamon mixture. Place on hot electric skillet for about 3 minutes, and then flip over and cook other side for 3 minutes (until golden brown). 5) To make Goat Cheese Drizzle: Place goat cheese, maple syrup, vanilla, nutmeg and cinnamon in a small saucepan over medium heat until goat cheese in completely melted, stirring continuously. 6) Drizzle goat cheese compote over french toast slices and top with sliced strawberries. 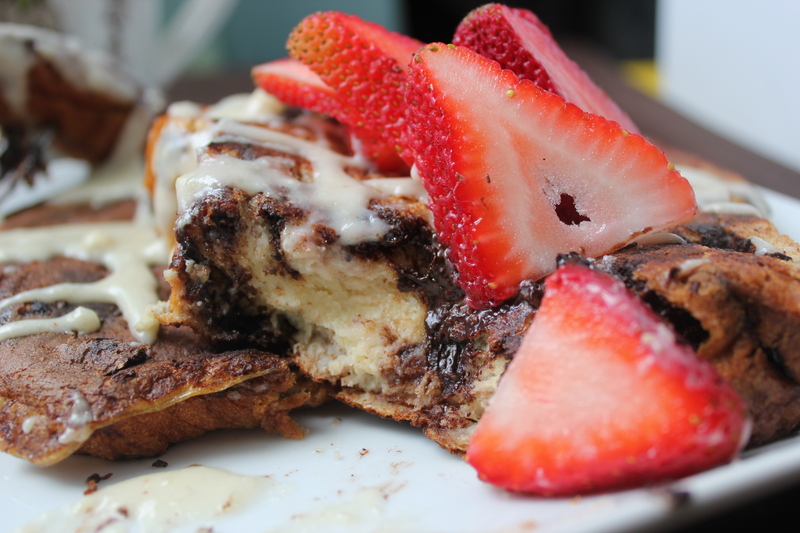 The goat cheese drizzle was the perfect compliment to the rich and chocolatey slices of french toast. 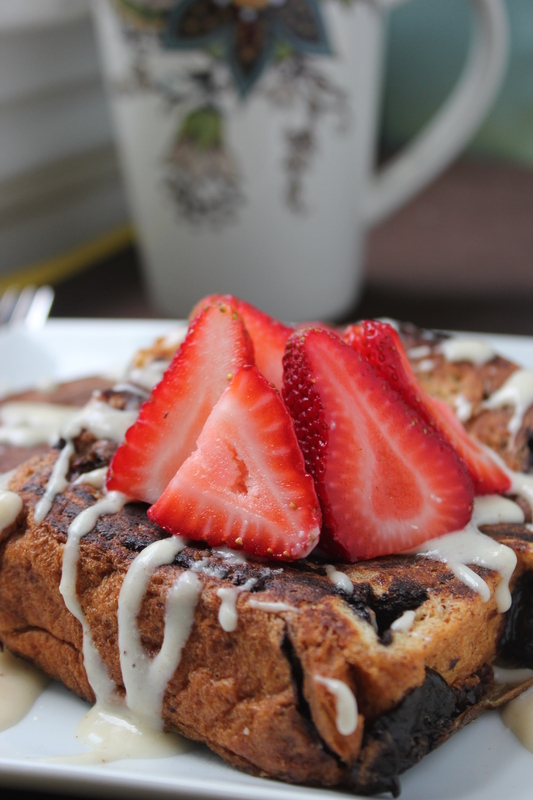 Even if you used regular bread as the base for the french toast, it would still be delightful! This drizzle would probably also be good served as little ‘fruit appetizer’ dip with all different types of fruits.